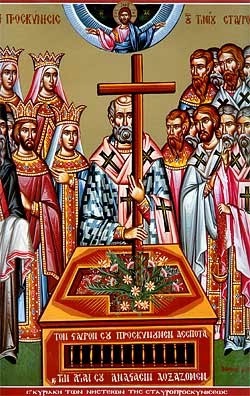 Today we continue to celebrate the Feast of the Exaltation of the Cross. It may seem strange that we devote certain periods of the Church year especially to the Cross because it is so characteristic of our entire life in Christ. No matter what else is going on in the Church or in our own lives, we may never leave behind the Cross, for our Savior calls us—just as He did His original disciples—to take up our crosses and follow Him each and every day. That is not a command limited to certain days or particular facets of our lives; it is simply a key dimension of what it means to be a Christian. Our Lord’s disciples, like the other Jews of that time, had apparently expected a Messiah who would have had nothing to do with a cross. They wanted a successful ruler, someone like King David, who would destroy Israel’s enemies and give them privileged positions of power in a new political order. So they could not accept His clear word that He would be rejected, suffer, die, and rise again. When St. Peter actually tried to correct Him on this point, Christ called him “Satan” and said that he was thinking in human terms, not God’s. To place the pursuit of worldly power over faithful obedience was a temptation Christ had faced during His forty days of preparation in the desert before His public ministry began. Then that same temptation came from the head disciple, and the Lord let St. Peter know in no uncertain terms that He must serve God and not the powers of this world. To place worldly success over sacrificial obedience was simply the work of the devil; we face the same temptations today. In complete contrast to what the disciples expected, the Savior told them that they too must take up their crosses and lose their lives in order to enter the Kingdom of Heaven. The same is true for us, for whatever false gods we are tempted to serve cannot conquer sin and death or bring healing to our souls. To serve them is to become their slaves and to receive nothing in return but weakness and despair. The word of the Cross is that we too must lose ourselves in the service of the Kingdom in order to participate personally in our Lord’s great victory and blessing, both now and for eternity. Though we do not like to acknowledge it, holiness remains on a collision course with the conventional standards of our corrupt world. That truth is the same for all nations, people, and cultures, for the way of the Cross judges them all. The witness of the martyrs from the origins of the faith right up until today in the Middle East makes that especially clear. But let us not think that taking up the Cross is reserved only for those called to make the ultimate sacrifice. For He calls every one of us to become a living martyr by dying to our sinfulness, to how we have corrupted ourselves, our relationships, and our world. And that way of death to sin is the Cross, for if we want to share in the joy of His resurrection, we must first participate in the struggle, pain, and sacrifice of crucifixion. That does not mean trying to put ourselves in situations where we will be harmed or convincing ourselves that we are persecuted for our faith whenever someone criticizes or disagrees with us. We must never distort our faith into a habit of feeling sorry for ourselves or justifying hatred or resentment towards anyone—much less to finding a way to use Christianity to gain earthly power and prestige. Our calling is to follow the example of our Lord as we forgive, turn the other cheek, and genuinely bless those who curse us. If we crucify others even in our thoughts for whatever reason, we turn away from the true Cross. The One Who offered up Himself calls us to crucify our own sinful desires and actions, the habits of thought, word, and deed that lead us to worship and serve ourselves instead of God and neighbor. That is very hard to do in a culture that celebrates self-centeredness and self-indulgence. In the name of being true to ourselves, people today justify everything from adultery and promiscuity to abusing and abandoning their own children. If any of their desires go unfulfilled, many feel justified in falling into anger, hatred, and even violence toward those who offend them. In our society today so much seems to revolve around our desires, our will, our pleasure, and our obsessive need to worship ourselves, rather than the Creator. But as we have all learned in one way or another, living that way simply makes us miserable, ashamed, and even more enslaved to our passions. That is not how God made us in His image and likeness to find peace, fulfillment, and joy. Yes, some may seem to gain the whole world by living that way, but they still end up losing their souls. In our day, there are many cheap substitutes for a life of holiness in which we truly take up our crosses and follow our Lord. Popular culture tempts us to believe that simply expressing ourselves is somehow really virtuous. While there is nothing wrong with “liking” a post on social media or putting a sign in our yard or a wearing a t-shirt in support of even the most laudable causes, simply expressing an opinion on an issue usually requires very little from us and does not change much. It is much harder actually to give of our time, energy, and resources to help a troubled or needy person than it is to agree with the idea of helping others. It is much more difficult to live a life of chastity and purity as man and woman in our decadent culture than it is to call for moral decency in society or to criticize others whose struggles we do not know. Most of us have more than enough work to do in purifying our own hearts before we start worrying about how strangers are doing, even if we see them in the news or on social media. Regardless of how correct we may be on any issue or problem, words alone will not suffice and may become a distraction from our own repentance, especially if they inflame passions such as self-righteous pride or judgment. In order for our faith to mean something, we must act in ways that require self-sacrifice and help to purify our hearts, if we truly wish to follow Jesus Christ. Some bear their crosses daily as they respond to sickness or other chronic personal challenges with patience, humility, and deep trust that the Lord will not abandon them. There is no “one size fits all” journey to the Kingdom, no legal definition, even as the Saints include people of so many different life circumstances and personalities. Regardless of our situation, we all have the opportunity to bear our crosses in relation to the particular challenges that we face. Most of us do not need to go looking for spiritual challenges; if we will open our eyes, we will see that they are right before us. At the end of the day, Christ calls us all to live as those who are not ashamed of His Cross. That means that we must take practical, tangible steps every day of our lives in order to die to sin so that we may participate in the new life that our Savior has brought to the world. If we do not, then we deny our Lord by what we do each day as much as those who worship false gods. In fact, we worship the false god of self whenever we do not follow the way of Christ in offering ourselves in free obedience to Him. Our ultimate choice is not between this or that issue or idea, but between the way of the Cross and all other ways, no matter how popular, easy, or moral they may seem to be. If we ever think that we are serving the Lord faithfully when our lives do not display any serious self-sacrifice, then we should think again. For we are not to commemorate the Cross only in certain periods of the Church year, but every day of our lives in how we live, how we treat others, and how we respond to our temptations, weaknesses, and chronic challenges. The Savior offered Himself in free obedience on the Cross for our salvation. If we are truly joining ourselves to His great sacrifice, then our lives must show it. Oh, wow. I’m going to have to read this again and absorb it. I am struggling with judging others. Thanks for your message. Alas, we all struggle with that one! Hang in there.